KIEV, Ukraine (AP) — In a surprising move after Russia flexed its military might in the Crimean Peninsula, Ukraine's new leadership has reached out to oligarchs for help — appointing them as governors in eastern regions where loyalties to Moscow are strong. Kolomoisky, a metals, banking and media tycoon, was named governor of his native region of Dnipropetrovsk, while Serhiy Taruta, the country's 16th-richest man, according to Forbes Ukraine, was named governor of his home Donetsk region. Both oligarchs are seen as pro-European and Kolomoisky's media have provided sympathetic coverage of the pro-Western protests. The move comes after other top oligarchs, including the country's richest man and a key backer of Yanukvoych's Party of Regions, Rinat Akhmetov, called for preserving Ukraine's unity. Experts said the appointments demonstrated that despite its strong ties to Russia, industry leaders in eastern Ukraine who provide jobs to tens of thousands of Ukrainians are against a split-up. "The oligarchs taking on this responsibility is a demonstration of their commitment to an independent, sovereign and territorially integrated Ukraine," former U.S. Ambassador John Edward Herbst told The Associated Press. For the head of a Kiev think tank, the decision to appoint the tycoons was a shrewd move. "It's a creative solution, which was dictated by the current circumstances," said Ihor Burakovsky, of the Institute for Economic Research and Policy Consulting. "A revolutionary situation requires revolutionary actions." Kolomoisky, worth $2.4 billion, according to Forbes, told the AP his task would be to quell any possible unrest in his region, which he said was being fomented by agents from Russia. "I hope that my presence in the region will help cool the few hotheads that are present here and stabilize the situation, to bring calm so that the citizens of Ukraine living in the Dnipropetrovsk region would feel safe," Kolomoisky said in a telephone interview. Asked whether he feared Russian troops in eastern Ukraine, Kolomoisky voiced hope there would be no violence. "We do have those concerns, but we hope that conflict between the Ukrainian people and the Russian people cannot take place," Kolomoisky said. "I believe it is absolutely impossible." The appointment of Kolomoisky, who is a prominent leader of the Jewish community in Ukraine, also belies Moscow's claim that power in Kiev has been seized by ultranationalist militants. The new government appointed last week promised quick reforms to achieve closer ties with the European Union. 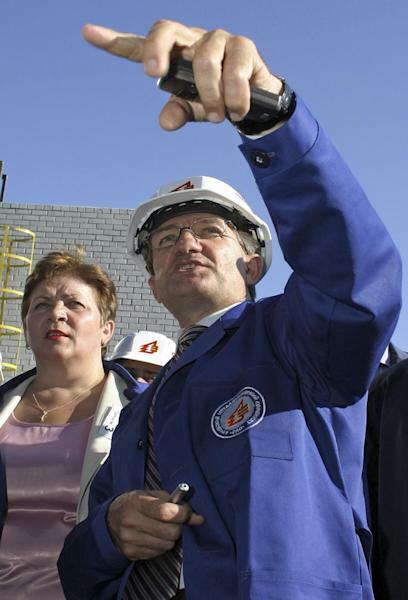 In Donetsk, a coal-mining region that borders Russia, Taruta said he had never planned to serve in the government, but accepted the governor's post because his country was finding itself "in dangerous times." "My decision is a desire to protect our country," said Taruta, who is the leader of a large industrial group and the head of a soccer club. "We Ukrainians have the right to a strong and united Ukraine." A test in Taruta's new job was quick to present itself. Clashes between protesters and police broke out early Thursday in Donetsk as police cleared pro-Russian demonstrators from the regional administration center who had raised a Russian flag over the building. The Ukrainian flag was once again hoisted over it. With all the oligarchs' patriotism, self-interest was also a big factor in taking the governors' jobs. With hundreds of millions of dollars invested in their industries, based mostly in eastern Ukraine, their empires could crumble were the country to split up or plunge into war. "The oligarchs understand very well that a significant part of their wealth is located and is formed in Ukraine," Burakovsky said. "And if events start happening in the country ... the problems that exist today, of course they affect the value of the business of our Ukrainian oligarchs." The decision carries long-term risks, because the tycoons may want to use their posts to promote their business interests. Kolomoisky, for example, is seen as an ally of former Prime Minister Yulia Tymoshenko, who was recently released from jail and who is believed to be wielding considerable influence through Turchnynov, her right-hand man. When Tymoshenko was prime minister in 2005, she was accused of lobbying for Kolomoisky's interests. "When we look at the political culture in Ukraine and the way politics have been working in Ukraine for the last decade, we can be at least skeptical towards what they are, what they are trying to get, what personal gains," said Steffen Halling, a researcher with the German Institute for International and Security Studies in Berlin, who studies Ukrainian oligarchs. A day after Kolomoisky mocked Putin's short height and called him mentally disturbed in a televised interview, Putin took the critical view of the oligarchs to an extreme during his news conference Tuesday, calling the tycoon a "unique swindler." Did Kolomoisky have a reaction to Putin's words? "I don't want to make any comment. He said what he said. He has the right to do so," Kolomoisky told the AP. "Let us call it even."